So I just did some two sided milling on my Nomad and the parts didn’t quite come out right in terms of the two sides aligning in Y (they aligned perfectly in X). This surprised me a little given that I had positioned the stock on two dowel pins oriented in a line perpendicular to the X axis along the center of the C3D sea of holes. I was using the center quick position in CM 4.12 for the milling origin. It then occurred to me that the sea of holes plate may not be precisely registered with the machine’s plate, or that the stored center coordiinates may not necessarily be calibrated with the latter. So, having a probe, I investigated, as shown in the attached image. I then moved to the pre-programmed center of the table and checked the offsets from the new zeros. 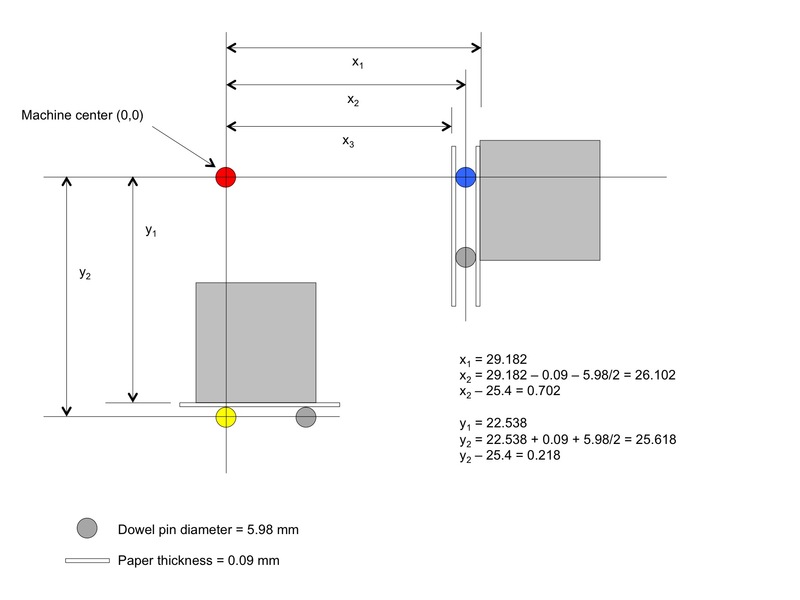 The drawing I’ve attached isn’t to scale, but the distance from the center of each dowel pin to the center of the table should be exactly one inch (25.4 mm). My calculations, shown on the drawing, show that the sea of holes center differs from the pre-programmed center by 0.702 mm horizontally, and 0.218 mm in Y. I should be able to use those measurements to get better precision on two-sided machining, though I haven’t yet tried it, by moving to the center quick position, jogging by the indicated amounts, then zeroing X and Y. Anyway, just thought I’d share (and I’d give other analytical minds who lurk here a chance to double-check my reasoning and math). Take a look at this post I did a little while ago to solve exactly this. Ah yes! I actually commented in that thread–your work probably planted the seed that eventually got me doing it without remembering your post. Having done it myself now, I’ll reread your thread with new interest and deeper appreciation! @patofoto has a method of centering that is probably more precise than using the probe multiple times, and it is linked above. However, it requires a threaded center locating punch, and the table I have has metric threads–unfortunately, McMaster doesn’t have metric threaded center locating punches (at least, I didn’t see them).